Estella's Revenge: October in Review! Thanks to the Readathon, October was a great reading month! Without it, I'm not sure where I'd be. 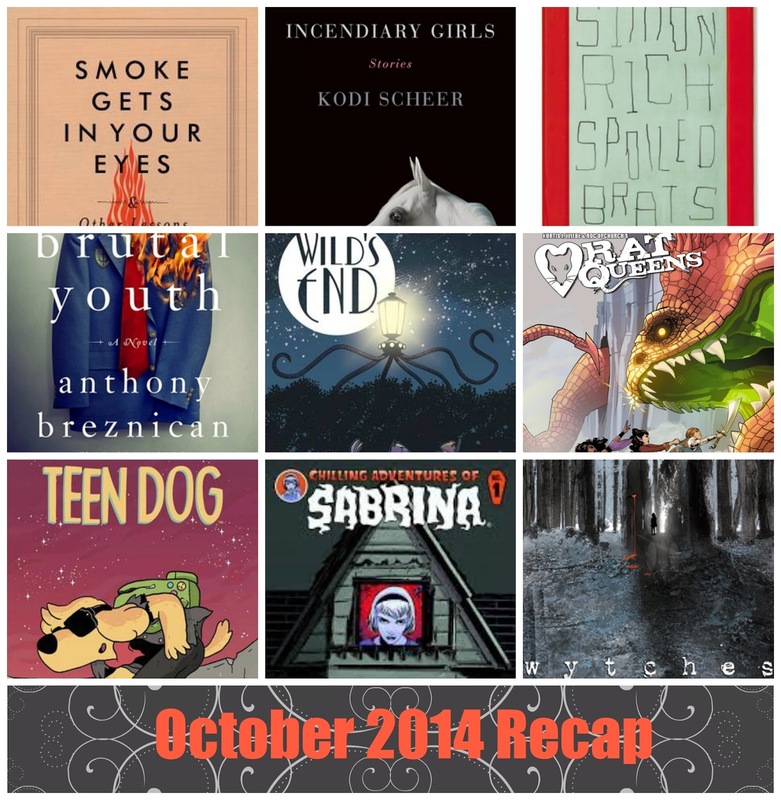 October was a mish-mash of novels, short stories, nonfiction and single-issue comics, and there were some definite stars in each group. Short stories really seemed to take the cake, which Incendiary Girls and Spoiled Brats both blowing my socks off. I've already posted my glowing review of Spoiled Brats, and I can't wait to glow about Incendiary Girls later in the week. I accidentally left Lumberjanes #7 out of my graphic up top. I adored this issue just as I've adored all the rest, so I want to take a moment to praise another great comic I read this month. 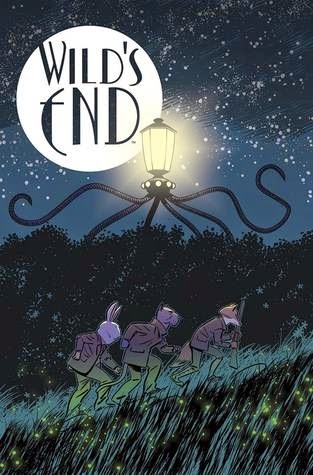 Wild's End #1, by Dan Abnett and I.N.J. Culbard. I'm itching for more issues of this. The artwork is just breathtaking, and the characters are unique and fun, amidst all the alien invading. I have a feeling there's much more to uncover about these folks in future issues. What impressed you in October? 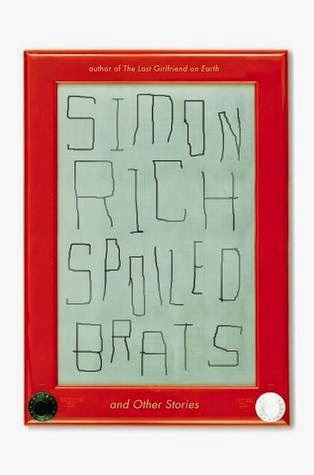 Spoiled Brats is on my list as one of the first fictions to tackle after Nonfiction November...looking forward to it! I hope you love it as much as I did, Sarah! Sorry to hear about your bloglovin feed! I really need to read more graphic novels. They used to be a large part of my reading, but lately they've fallen to the wayside. October for me was Blue Lily, Lily Blue despite the other awesome books I read. My graphic novel consumption has really skyrocketed since I started using ILL. Before that it was just too hard to come by affordable ones. I'm glad you've ditched Drood and moved on to more enjoyable reading. Life is too short, indeed! If you ever need short story recs, I've got 'em! I loved Spoiled Brats too and will watch for your review of Incendiary Girls. It was soooo good, wasn't it? Incendiary Girls is coming up this week! Spoiled Brats looks awesome! I definitely got my eye on it! It was so much fun! Happy November reading to you! What impressed me most about October was the complete exhaustion I experienced! One of my friends told me this is when teachers enter the "disillusionment phase," and I have to agree. I got lost in China Mieville's Perdido Street Station, which took me out of this world into a completely alien universe, for which I am extremely grateful. Also grateful for all the days off in November! I can understand that re: disillusionment phase! I have so much to do for my online classes it's sort of overwhelming. Enjoy those upcoming days off! The artwork on Wild's End looks very intriguing. I might have to see if I can get my hands on a copy. It is absolutely stunning! So lush and it really pulled me into the story. I have the Lanagan book on my ereader! Sounds like I need to bump it up on my "to read" list! I read A Month in the Country and I got my literary fiction mojo going again. Yay Spoiled Brats! 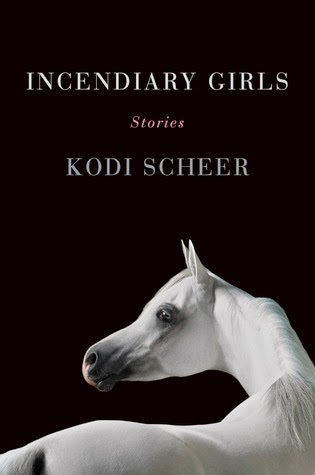 I'm really excited to hear more about Incendiary Girls...I'm kind of on a short story kick right now. Who would have thought?!? Right??? Same here. Incendiary Girls is coming up this week. Can't wait to share what I thought! Yay! I'm so glad someone else has read it! I've seen almost nothing about it, and it deserves ALL the attention! Thanks for the heads up about the giveaway! You and Shannon make me want to read Spoiled Brats. Your October looked like a fantastic month of reading. Lots of variety there! You should! I think you would be IN LOVE with the snarky humor. Aghh I need to read Spoiled Brats! Simon Rich is the greatest. I really think I need to get my hands on Lumberjanes, especially with how much you rave about it! I think my fave read from October was probably The Haunting of Hill House. I really liked that one, but Unbroken was a close second. I am only now getting back into a reading groove after Duncan's birth and adjusting to two kiddos but am really looking forward to following this in December - what a great idea!